“Innovation” seems to be the new buzz word in education these days. There’s a lot of talk, but talk, ideas, research and plans are nothing without ACTION. When ACTION begins, innovation happens, change starts and improvements are made. Are we talking about innovating or are we innovating? There’s a difference. If teachers, students, principals, administrators and boards are in fact innovating, are they SHARING? In my experience, SHARING is the most important ingredient in innovation. That’s when there is real potential to make a difference and to change the world. By sharing our innovative ACTIONS we’ll create a culture of innovation and move forward together. Technology has given us the ability to share in far reaching ways. In my experience, sharing innovation makes both my students and I more motivated, reflective and empowered knowing that in some way we have helped to Make A Difference. More can be read on this in my recent blog post “Innovating 4 Good in the Classroom”. I’ve created a model that has helped my students and I to innovate in the classroom. You’ll find on the model a line that I’ve called “The M.A.D (Make a Difference) Innovation Line”. The model works from bottom up, starting with a question and ending by sharing. 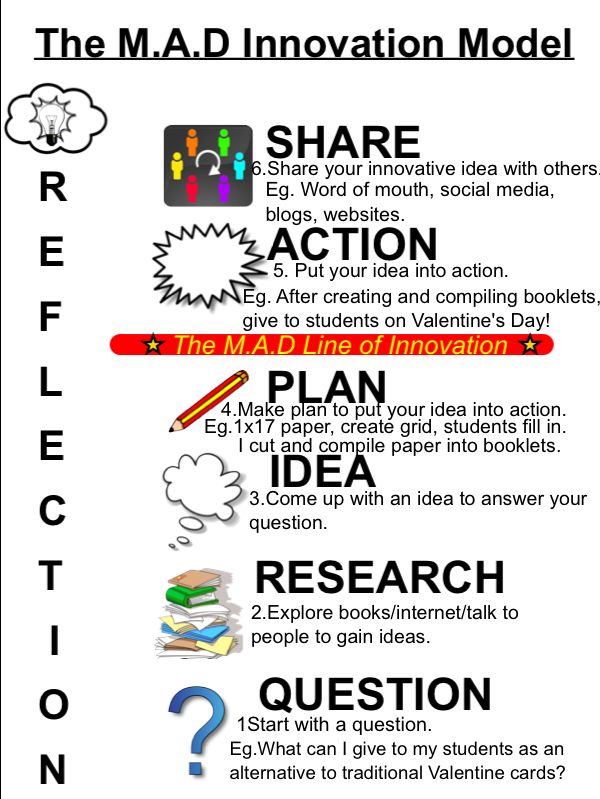 Reflection should occur during every stage of the M.A.D Innovation Model. When we get above the line, innovation happens and making a difference begins. The more we share, the more we have the potential to Make A Difference! Let me explain the model with an example, an innovative idea I had many years ago. I always wondered (QUESTIONED) what I could give my students in place of the typical throw away Valentine cards. Could I make the Valentines I gave more meaningful and lasting? I RESEARCHED the internet and spoke with friends and family about their favourite types of Valentines. I found out that what people liked the most were the words from the heart that people would share. I had an IDEA to have my students give one another compliments on Valentine’s Day. I needed to make a PLAN. How would I efficiently and effectively do this? After reflecting, thinking and trial and error, I had a plan for creating the compliment booklets I envisioned. I had to follow through with the plan and put it into ACTION. I had the students give one another compliments, compiled them into mini booklets and distributed them to my students on Valentine’s Day. This is where the INNOVATION happens and the difference making begins! My students and I had made a huge impact on one another’s lives by simply sharing compliments. To this day, I still have all of my Compliment booklets and everyone of my past students that come back to visit or that I meet outside of school say they still have and cherish theirs. Some of them are 26 years old! For years I kept this idea to myself. But last year I SHARED my Compliment Booklet idea on my Mr.C’s SharesEase website and to date that particular page has been visited 1000+ times. Who’s knows the difference the sharing of this simple innovation has made. Below is the M.A.D Innovation Model used to illustrate the above innovation. I’d love to hear your thoughts about the model and more importantly, please feel free to share what you and your students and doing to innovate in your school! Feel free to visit our M.A.D Project innovation page where you’ll find many more ideas and resources for innovating to make a difference in the classroom. One more stage – get hammered by your school board – maybe a cynical point, but too often the case. Make sure you innovate within a very small box!